Since the creation of the game of roulette, gamblers have always searched for systems that they could use to help them beat the odds, and consistently walk away from the game with more money than they started with. Unfortunately for these gamblers, the search still goes on today, and the likelihood of happening upon a flawless roulette system is looking very bleak indeed. In roulette, the odds are always marginally in the favour of the house, regardless of where you place your bets. For example, you get 1:1 odds for an even money bet like black or red, but due to the presence of the green '0' (or green '0' and '00' in American roulette), the probability of hitting either red or black is slightly less than 50%. This means that you have a negative expectation, and you are losing a small amount of money for every bet you make over the long run. Therefore, it really does not make a difference as to where you place your bets, what order they are in or how much you bet, because at the end of the day the casino is always going to have the edge over the players. Unlike in Blackjack where your equity changes depending on your strategy, they are always going to be fixed in Roulette. This means that you should expect to lose more money than you win over the long run, despite the fact that you may well win money on the odd occasion. You can try as much as you like (and trust me, people have tried! ), but there is no combination or betting system that will turn the odds into your favour. So just enjoy the game and forget about any magical systems. Nonetheless, this doesn't seem to deter people from creating their own roulette systems, and trying to sell their systems to other people. For example, the Martingale system is most likely the most common form of roulette betting system that you will come across, and the majority of “new” systems will be based around this flawed system created many years ago. There are a number of other popular systems that people use today to help them improve their chances of winning, but more often than not they do not end up working quite as they expected. However, you can be sure that people will continue to work out new and improved systems to one day try and get that edge over the roulette wheel, no matter how impossible it may be! The true value of these betting systems comes from their entertainment value. If you can remember that these systems do not win you money, then you can have an enjoyable time working with them and viewing the results. 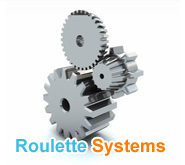 So here is a quick summary of the most popular roulette betting systems that you will come across.